What Should I Back Up? - Ask Leo! Backing up is incredibly important. Knowing what to back up, where to back up, and how often to back up are just as important. I purchased backup software and even after reading the online documentation, I don’t understand what files I should be choosing to back up. And will I burn these to a disc or put them on my hard drive? I have the PC’s installation files so I know I don’t really need these, but I am so confused. Good for you for even getting this far. So many people don’t bother to back up at all and end up regretting it later when the inevitable disaster happens. There are several answers to both of your questions. Which to choose depends on what you have, your level of expertise, and how much effort you want to put into understanding and configuring your backup. As always, there are tradeoffs. I’ll start by outlining what I do, since it’s a combination of paranoid safety and relative simplicity – even for me. It backs up to network-connected storage device (the equivalent of a NAS). I back up everything on my C: drive, which is typically the only drive in the system. By everything, I mean the drive and everything stored on it: all partitions, the operating system, programs, and data. This is referred to as an image backup. I use the Macrium scheduler to automatically perform a full backup once a month, in which an image of everything is copied. I use the scheduler again to perform an incremental backup every night. This backs up only everything that’s changed since the previous incremental or full backup. That’s it. Everything is backed up every night. Should I lose something, even the entire hard disk, I can recover using the previous day’s backup. Now, let’s look at those decisions I made, and how you might or might not make different ones. To start with, you should never back up to the same hard drive that you’re backing up. One of the major points of a backup is to be able to recover from a hard disk failure. If your backups are on the same disk that just failed … well, putting it technically, you’re screwed. I also don’t recommend backing up to a second hard drive contained within the same machine. Both hard drives are vulnerable to problems that could take them out at the same time. Things like power supply failures or malware could render both your primary hard disk and your backups inaccessible at the same time. The most pragmatic solution for most people, in my opinion, is an external hard drive. There are several reasons: it’s always there and ready; purchase a large enough one, and it’ll hold multiple copies of your entire backup; and it’s portable – should your machine die, you can just move your external hard drive to another and recover your data. Backing up to another machine on your local network, as I do, is also a very reasonable approach, though it will probably be slower than a directly-connected device. I no longer consider optical media, like DVDs, as an acceptable destination for backups. Besides requiring manual intervention to load and unload – which prevents any automation – they’re typically too small for most backups. I also have mixed feelings about using flash drives. External SSD-type disks may be OK, since they’re roughly the equivalent of actual hard disks, but inexpensive thumbdrives and the like simply wear out too quickly and randomly to be something I feel comfortable counting on for something as important as a backup. If you don’t know exactly what should and should not be backed up, then back up everything. That means backing up the entire drive, as I do. There are other advantages for this, as we’ll see in a moment. 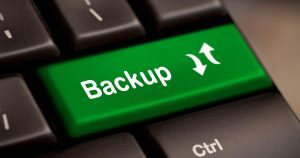 If you do know exactly what should be backed up, you know what you are doing, and you have a strategy for recovering your system (including the things you choose not to back up) after a catastrophe, then by all means, back up only what you know you need. The problem is that it’s extremely difficult to know what to back up. Programs place data files and settings and all sorts of random things in all sorts of random places on the hard disk. A backup of everything allows you restore everything. By that, I mean when things go bad, you will be able to restore your entire system – operating system, programs and data – in one operation. Backing up only what you think you need means that to restore, you’ll need to reinstall the operating system, reinstall the applications, reconfigure the applications to your preferences, and then recover your data from backups. This is a much longer and more error-prone path. I can almost guarantee you at least one file you’ll wish you had backed up will have disappeared forever. You can guess which way I’m leaning: back up everything, it’s safer. The exception: if all you have to back up to is small media, like the DVDs I mentioned earlier, you may need to make some hard choices. Backing up “My Documents” and everything in it would be a start. Then look at where on your hard disk your programs store your data, and back up those folders as well. Be prepared for a long recovery process should you ever experience a failure. This should really be a function of only one thing: how heavily you use your computer. If, like me, it’s your primary business and source of income, then nightly backups are a must. There’s no question. Even if you don’t have a disaster, the ability to recover a file you had yesterday but accidentally deleted today can be a huge time saver alone. If you are just a casual user, your needs may be different. One way to gauge your needs is simple: think carefully about what you do on your computer – perhaps monitor yourself for a week. Now, pretend you suddenly lost that week’s worth of activity – all pictures, email, documents, whatever – everything that happened in a week, gone. Does that hurt? If it does, you need to back up more frequently than that. If you don’t care, perhaps less frequently might be ok. Importance. You may not use your computer heavily, but when you do use it, it’s extremely important. In this case, you may need to elect for more frequent backups to preserve that important information. Convenience. The practical reality is that if your backup plan involves swapping DVDs in order to make it happen, you’re probably not going to do it as often as you should. Shoot for more frequently than you need, so you actually do it often enough. Of course, particularly if “important” and “convenient” are at odds with each other, you may very well want to consider purchasing better back-up media – like that external hard drive – so you can automate the back-up process. Relying on your memory is also not necessarily the best approach when it comes to backing up. Regardless of how you do it, where you do it, and (to a lesser extent) how often you do it, the most important thing is simply that you do it. Given the incredibly large amounts of information we rely on our computers to retain for us, backing up has never been more important. Should I back up to DVDs? - In the past it was common to back up to DVDs. Today, the landscape has changed, and backing up to an external hard drive is more appropriate. Is an external hard drive better for backing up than DVDs? - DVDs can be a clumsy solution for backing up - especially if you want to take a full system image. It's much better to go for an external hard drive. If External Hard Drives Can Fail, Should I Bother with One? - Certainly any hard drive can fail. Failure is a fact of life - data loss does not need to be. 1: I also use EaseUS Todo to the same effect on different PCs. I use both so as to be able to recommend either. « Previous post: How Can I Keep Data on My Laptop Secure? Acer replaced my motherboard and DVD recorder. Probably keyboard. They restored the factory Win 7 Home Premium. It booted no problem. Not surprising. I had to reregister Win 7 after I booted it from an image I had made before sending to Acer. It went through w/o any issues. I keep LOTS of stuff on external USB hard drives. If my computer dies or some other issue comes up, I am covered for lots as well. That is also where some of the images reside. Others are on SD cards totally separate from the computer. Thanks for your immense computer knowledge, Leo. Not a stupid question at all, and you raise a good issue. completely different machine, then things get confused. used to recover data and other files from the old system. You can restore the FULL backup to anywhere you like. It doesn’t matter if it’s the same drive on the same PC or a different drive on a different PC. What does matter is the chipset on the motherboard. If you were to try restoring on a machine with a different chipset, you will get the blue screen of death on boot up. Same chipset, you get a full boot up and no problems. Any other driver that wasn’t installed before would get recognized and changed on the spot. If you were get a blue screen of death, simply pop in your Windows CD and do a repair install. You will keep your old registry and files so you lose nothing, but now, windows is configured on your new chipset from fresh. Why did you not suggest an off site backup service, such as Mozy. 2 gb is free. I backup about 15 gb which by encoding is reduced to about 1.6 gb. It runs once a week and takes about 30 minutes. I realize I’m only backing my data and not the operating system, so in case of trouble it will be trouble. I probably should backup the whole thing and pay the freight. I also use Acronis TrueImage to create and image of my entire C: drive twice a month. So if I have a failure I can quickly return back to the way things where, in about 1-Hour. I have done the format/reinstall everything nightmare before, which in between working, took a week to get everything installed, updated, and reset back to the way I like things. Acronis TrueImage is the best way to go. Also, whenever I create or change an important file I immediately back it up to a USB pen drive. And once a month I copy my MyDocuments folder, where I keep all my files, to 2-CD’s and keep that at another location. So if my computer died I can just copy the MyDocuments folder onto the new computer and not loose anything. http://blogs.cnet.com/8301-13554_1-9752330-33.html for an argument against). conflict at least occasionally with my own use of my internet connection. So I’m not really arguing against – there’s a lot to be said for the approach. I’m just not ready to say yes to it. Two comments about Acronis True Image. (1) It is NOT A TRUE image, at least not the last time I checked (and I checked multiple versions of the product). By this I mean that unlike a real image backup, it does not backup all hard disk sectors but instead only backs up sectors that Windows thinks have files on them. This means that if the file system gets screwed up, the backups are useless. I also think it skips things like the page/swap file and the hibernation file. While these two files can be safely skipped, once you start skipping anything, you open yourself up to making a mistake. (2) True Image is a Windows application and I don’t like the idea of backing up an OS from the inside while it’s running. I much prefer to backup Windows from outside the OS with a disk image program that runs off a bootable CD. what about norton ghost. i got a triak with my dell and had to one restore and it came up. can i delete it or is it good to keep on the computer in case of crash? You did not mention the cost of Acronis True Image 10. Is it a one time purchase or a monthly fee as long as you use it? Acronis is a one time purchase. Leo, maybe a stupid question but how hasn’t your 250GB external drive filled up by now? Every month do you delete the previous month’s incremental backups in order to free up space, or do you literally still have every single incremental backup going back all the way to the beginning of when you started doing this? I’m a little confused because in another post you said backing up your machine took around 40GB. So it wouldn’t take many months to use up the entire 250GB external drive. Actually my monthly full backups are now around 80gig, and my every-other-night incrementals are between 1 and 14 gig, depending on how busy I’ve been. You can see since writing the article I’ve switched to every-other-night incrementals, because I would fill up the external drive in less than a month. I save each months full backup for “a while” by copying it to other storage I have here, and “a while” varies depending on available disk storage. Ultimately I’ve never had to go back more than a few days, so most of my older saved copies are likely not needed at all. Each months incremental backups automatically overwrite the incrementals from the previous month. I have been having problems, with my Dell 1520 laptop, that may or may not be the HDD. I did not want to wait to see if I was right. So I went yesterday (after reading your article) and bought Acronis and a 500GB Western-Digital MyBook external HDD (about $140US in all at BestBuy). Then I went straight home and backed up everything in my computer; settings, both users accounts, and the OS. Is copying my files to an external drive the same as backing up files to an external drive? If there is a difference, I would be very interested in an explanation. If that drive dies, the files will all be lost. If really important, keep in at least 2 places, maybe not connected like flash drives as well. A power surge to a powered USB drive could damage that. So some things I keep a copy on separate USB flash drives, like my bank account info. I made a mistake when I had my main 500GB hard drive partitioned with a dual boot XP/Vista setup. They are C(Vista) and F(XP), each taking 30GB’s, and 2 more partitions, D and E, taking up the remainder of the 500GB space. I want to back up and clean up the C drive because it keeps losing GB space every day for some reason, even though I NEVER DOWNLOAD OR SAVE ANYTHING TO THE C DRIVE/PARTITION, and now I am down to 2 GB free space available on the C drive(Vista) operating system. I can reclaim 2-3 gigs by defragging every other day but I still lose multiple megs of space daily anyway. It seems the “Windows” folder keeps having folders and info added to it regardless of where I put stuff. Why does that happen? I never use the F(XP) system at all, so that’s 30GB that I could use for my C drive and it is sitting useless! I would like to recapture at least that space for the C drive. Is reformating the only way it can happen? My question is, if I backed up everything and reinstalled Vista on the 500GB disk, will the other partitons automatically get lumped in as partitions with the C backup when I brought them back to the new partiton since they are already partitoned with drive letters from the original 500 GB hard drive allocation? I have 2 external HD’s, one 320GB and one 250GB, so either would accept either the D or the E drive info as well as the C back up, so I can move them over as partitions. I’m just wondering if there is a simpler or more efficient way to salvage all that data without reformating everything. I totally agree, however given the number of people who don’t backup at all, and the number of problems that would be resolved by a backup, even if an external drive sitting next to the same machine, I’m happy if I can get people to do that much. I, like you, have Acronis so I tried to set up my back ups the same as you described. I do have a question however. When you set up the monthly full back up, is it set to the same file as the Incremental back ups? That is, does the monthly back up just overwrite the previous full months back up and its incremental back ups? Essentially, yes. I do archive the initial monthly full backup for long term storage / archival. I also keep a backup off site. That means more than one external drive and swapping used to take one to work now retired at a friends house. Exactly.. I’m using AOMEI Backupper to do a monthly system backup for my work computer, and it automatically run which does simplify the backup thing. I just used Macrium Reflect to make an image copy of my C: drive. My c: drive is 2TB and I’m using 239GB. It took over 2 hours to complete the backup. Is that normal for my computer which has a 3.4GHz i7-4770 CPU and 24GB of RAM? I’m running Win 8.1. I’ll be upgrading to Win 10 next week. Will it be faster on Win 10? A full backup of that size taking 2 hours is reasonable. I can’t see how it would be noticeably faster in Windows 10. It could be a little different in that it might be a little faster or even a little slower. I can be normal. It depends more on the speed of the disks, and the USB connection you’re using. On my last post I forgot to mention that I’m backing up to Western Digital 320GB external drive. Hi Herb; it’s useful that you’ve explained that you’re copying to an external disk. The important aspects of backups from a timing point of view are a) how fast can the original disk read data and b) how fast can the backup disk write the data. Backup programs effectively read relatively small amounts of data off disk into memory then write it out again. Fast CPUs and lots of memory don’t really help this. The version of Windows will make no noticeable difference as it plays little part in the process. The process is actually limited by the slowest of the disks; a slow input disk will slow the process as the output disk will be continually waiting for the input disk. A slow output disk will mean the input disk although faster, won’t run faster, as it has to wait for the output disk. As Mark says, 2 hours is not unreasonable for backing up the 239GB you’re using. I am a senior teaching other seniors about computers. On the subject of backups I emphasize that this is insurance against potential loss and that they can use OneDrive which gives them 5GB of free storage. While this may not be a perfect solution, for most of them, the ease of use is a preliminary and easy method. Am I being naiive? For most of them, some backup is better than none. Could I have your comments? Some backup is better than none, absolutely. But how certain are you (or they) that everything they WANT backed up is in fact in their OneDrive? Everything rests on the answer to that question. I use the free version of Macrium Reflect. The free version doesn’t have an incremental facility so I do regular differential backups weekly. I also do a full backup monthly. I do both system disk image and separate data backups. I now have several full backups and many more differential ones. I want to save some space by deleting some of these backups but it isn’t clear which of the full backups the differential backups are based on. Is the latest differential linked to the earliest full backup or to the latest? The latest differential backup is linked up to the full backup you set it up to work with. If you backed up the computer to a system image file and scheduled differential backups along with it, then the differentials would be based on that image file. They should have the same base name, and will probably differ only in the last few characters. Many thanks for the replies. Thanks to you both I now have Macrium backups sorted. I’m preparing to upgrade to W10 and thought I’d use Windows own backup system as an extra safeguard if I decide to revert to W7SP1. For some reason it wont quite complete due to lack of drive space although there appears to be ample free space and the backup folders are showing empty. Does Windows store the ongoing backup somewhere other than the target drive temporarily? CC Cleaner isn’t showing any massive temporary files. Should I just stop wasting your time and forget the Windows backup? It’s impossible for me to say with the details at hand. Windows own backup SHOULD work. Personally, I don’t like it (it’s not nearly as transparent about what it’s doing – this might be an example). If I create a system image backup using this computer with Windows 10 OS, will it install on a different computer using the same operating system? I’d expect it to work, I just wouldn’t count on it. Restores to dissimilar hardware work more often than not. Actually my experience is otherwise. They tend to either fail catastrophically (at least then you know) or they appear to work, with some obscure landmine of failure laying in wait. It CAN work, but it cannot be guaranteed. Your experiences are actually quite different to mine. I’d say it works seamlessly about 60% of the time; problematically about 35% of the time; and not at all about 5% of the time. It’s certainly not a reliable process and, as I said, not the best way to migrate data to a new machine. I’ve been able to make it work on every computer I’ve tried it on, but in every case it took some work to get all of the drivers working (even on similar machines), and in some cases it was a frustrating process. Frustrating and sometimes very time consuming. It’s certainly not the best way to migrate data to a new machine. Acronis claims that its Universal Restore will restore to dissimilar hardware. Restoring the software, and having it *actually work* on new hardware are two totally different things. I agree with comments above and wouldn’t rely on it. @Frank – Google it and you’ll see that it’s not unusual for people to encounter problems with Universal Restore. What option do you check for a full image backup in EaseUs Todo? It doesn’t seem obvious to me. That would be the System Backup button. Check out the video series at http://todo.askleo.com – it’ll walk you through that.